How to Conduct a Year-End Review for Your Writing: 25+ Questions to Consider – via TheWriteLife.com –Sometimes it’s important to take inventory of what you’ve done so that you can get a better idea of where you’re going. How was your 2016? Marketing tip: link your blog posts to Goodreads and Amazon – via CreateSpace.com – A blog is a great way to let your audience know what you’re up to. Making sure it’s linked to the right websites and resources is key to making it successful. 1 Simple Marketing Tip to Boost the Reach of Author Facebook Pages – SelfPublishingAdvice.com – Facebook is a great way to stay in touch with family and friends. It can also be a wonderful resource for promoting and marketing your title. How the Age of Digital Books is Fostering the Writing and Self-Publishing of Mid-length Books – via SelfPublishingAdvice.com – Is more better? An interesting article about how digital books and publishing are changing the way authors approach shorter, more concise content. Apps for Voice Over Actors – via VoiceOverHerald.com – Need to record an audition on the run? These apps can help your smart phone into a mobile studio. Are Your Prejudices Hurting Your Voice Overs? – VO Master Class – You know what they say about people who assume… Gary Terzza explains the psychology of assumption when it comes to traditional roles in narration and how they can hinder your performance. The 5 Elements of a Winning Voice Over Audition – via Michaellangservo.com – Every audition is different and each needs to be approached as such. Check out these helpful suggestions for how to turn auditions into offers. Video Lessons and Resources – via ACX.com – Sometimes you don’t need to scour the internet for great advice and resources for getting started with #vo work. The ACX website has a wealth of helpful information from video tutorials to Amazon wish list of equipment to help you get started. Wel come back to the second half of my two-part home studio setup series. Last week I covered where to place your home studio, how to properly soundproof it, and the basic equipment you’ll use in it. Today, I’d like to share real-world examples from three Audible Approved Producers. Let’s look at (and listen to) the great results a home studio can produce. 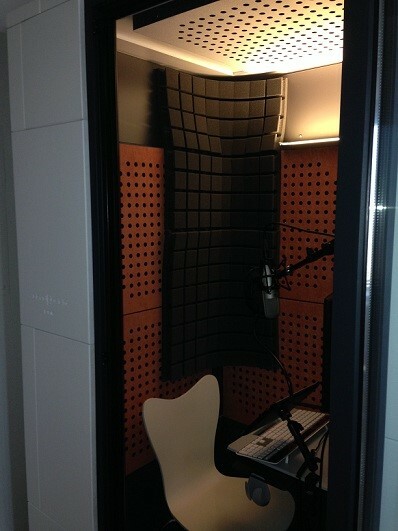 The controlling and deadening of acoustic reflections in her bedroom and specifically around the microphone is one of the main contributing factors to the professional audio quality of her recordings – Ben Glawe of Visible Sound Audiobooks. The biggest noise problem with my bedroom was my window, which overlooks a a noisy street in Brooklyn as well as a park. I bought special blackout curtains which block out light and sound from windows, which lowered the outside noise to acceptable levels. My laptop fan was also leaking noise into the microphone, but the addition of a silent laptop cooling pad fixed the problem. Now we’ll hear a recording from Visible Sound’s space. You might be surprised how good it sounds! Kate Udall got her start as a narrator at Audible Studios. After working on her production chops and securing some great ACX titles, she earned herself the Audible-Approved Producer distinction. Kate’s studio is a great representation of an effective DIY home recording setup. We call it Fuzzy Jail around here. It is made of blankets, the size of a cell and I am often inside in locked-down solitary confinement. 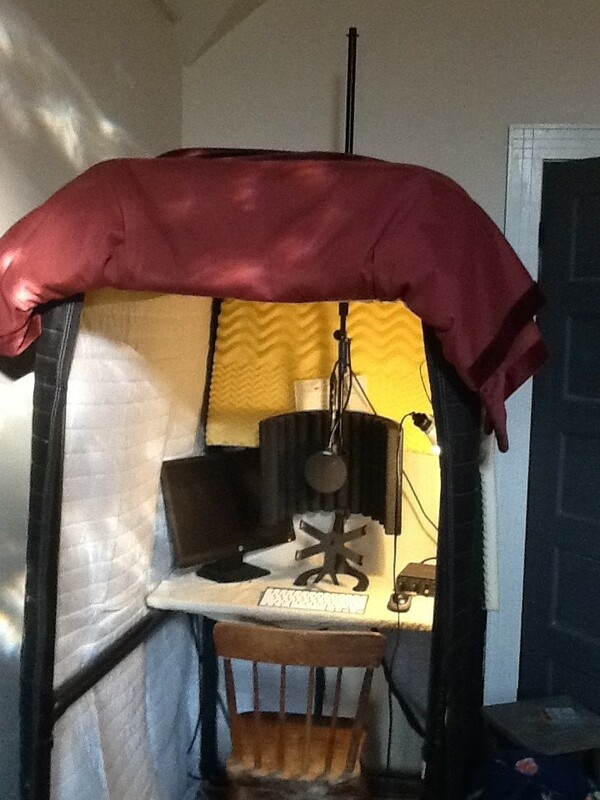 Kate uses thick packing blankets to isolate her recording studio from the rest of the room’s noises, which also provides the added benefit of reducing sound reflections that may otherwise occur on the side wall to the left. Her microphone is situated in front of an Auralex Mudguard, a great tool that can further reduce sonic clutter that occurs in home recording environments. She is also wise to set up an external monitor and other necessary components so that her laptop, which sits outside of the recording environment, does not introduce more artifacts and noises into the recorded signal. Our final example shows the upper limits are of home audiobook production. Yes, you are looking at a home studio! This photo comes to us from veteran narrator Stephen Bel Davies. Located in his Manhattan bedroom, this Studiobricks* installation is the top-of-the-line option for home recording due to its incredible noise-blocking capabilities and reflection controlled environment. Acoustic treatments on all walls, as well as the ceiling, guarantees a deadened recording space with extremely dampened artifacts and reflections. While Stephen is able to achieve a stunning -60dB of sound reduction with this setup, it doesn’t come cheap. These installations will set you back about at least $4,000 before factoring in installation costs. Still – one can dream! Here is a bit of audio produced in Stephen’s studio. 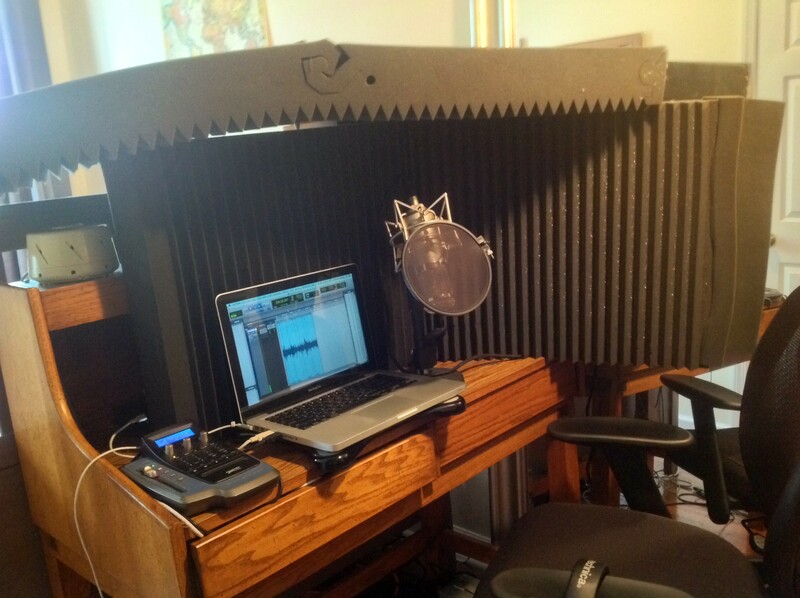 While Whisper Rooms are an ideal recording environment for any audiobook narrator, they are not necessary to produce a great recording. The most important consideration during an ACX production is consistency – both in practice and in aesthetic. For this reason, after you’ve installed your home studio, I strongly encourage you to read up on my four-part series, How to Succeed at Audiobook Production, which goes over methodologies to ensure success with your new audio production system. How do you achieve a professional recording? Leave your feedback in the comments below.